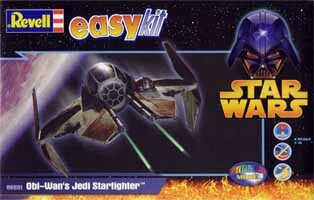 Obi-Wan's Jedi Starfighter is one of six easykits with a Star Wars theme. 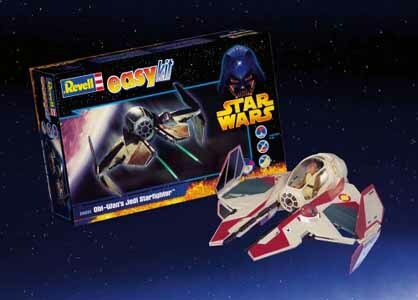 And if you've seen the new movie, Revenge of the Sith, then you'll no doubt be eager to own one of these cool vehicles. Ideal for less experienced modellers, this kit is pre-decorated and simply clips together - which means that young children can easily construct their own model without getting glue and paint all over the place. Not only is this ideal for the younger modeller, but for adults, like me, who never managed to get the hang of gluing together lots of fiddly bits of plastic together. The end result is pretty impressive and nicely detailed. Now you can end up with a model to be proud of - something you can put on display. And it won't break teh bank either.